The activity of a meteor shower is thought to be proportional to the activities through time of the parent comet. 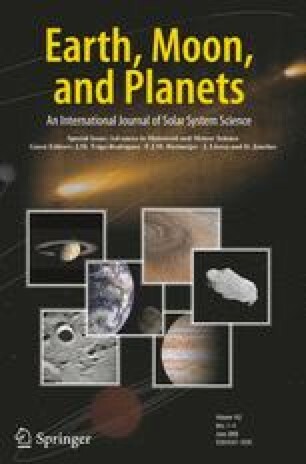 Recent applications of the dust trail theory provide us not only with a new method to forecast the occurrences and intensities of shower activities, but it is also offers a new approach to explore the history of past activities of the parent comet by retro-tracking its associated meteor showers. We introduce the result of an effort for relating meteor shower activities to the parent comet activities for which we chose the October Draconids and comet 21P/Giacobini-Zinner in this paper. We would like to thank Dr. Frans J. M. Rietmeijer for his kind advices as a guest editor. We would also like to thank two referees, Dr. Juraj Toth and anonymous, for thier constructive comments on our paper. This research was partially supported by the Ministry of Education, Science, Sports and Culture, Grant-in-Aid for Scientific Research (C), 195404490002, 2007.